Inspired by Bob Geldof’s Band Aid, the charity super-group USA for Africa was formed. They recorded the song “We Are the World”. The idea for the creation of an American benefit single for African famine relief came from Harry Belafonte, who, along with fundraiser Ken Kragen, was instrumental in bringing the vision to reality. They made a great decision of having Michael Jackson and Lionel Richie write the song. The song was released on March 7, 1985, and peaked at #1 on April 13, 1985. “We Are the World” raised over $63 million. The combined revenues raised from the sales of “We Are the World” and Hands Across America was almost $100 million. Question: What show followed a group of gifted students in the Individualized Honors Program? Last Question: What show, starring Ann Jillian, aired from 1980-1982, was cancelled, then returned with new episodes in syndication from 1985-1989? It’s a Living was a sitcom about waitresses who worked in a fancy restaurant, called “Above the Top”, located at the top of the Bonaventure Hotel in Los Angeles. The show aired on ABC from 1980 to 1982. The first season was affected by the Screen Actors Guild strike. The season was cut short, and was not successful. When it returned after the strike, the show was renamed Making a Living. This did not catch on either, and the show was cancelled. There were 27 episodes that had aired, and were run in syndication in 1983. Surprisingly, the reruns gained a huge following. This prompted the producers to bring the series back. In 1985 the series was brought back with it’s original title, It’s A Living, with the addition of a new waitress – future Wings star, Crystal Bernard. But, just before resuming production on the show, Ann Jillian (then 35) made headlines when she was diagnosed with breast cancer and she became a vocal advocate for cancer research and prevention. She left the show after it’s 1985-1986 season so she could focus on beating her cancer, with treatment including a double mastectomy. The show continued it’s successful run until 1989. Meanwhile, Ann Jillian’s battle with cancer was made into the top-rated 1988 made-for-TV film, The Ann Jillian Story, in which Jillian portrayed herself. Jillian received her third Emmy Award nomination, for Outstanding Lead Actress in a Miniseries or a Special, and won a 1989 Golden Globe for Best Performance by an Actress in a Mini-Series or Motion Picture Made for TV. In 1989, Jillian starred in a new show – Ann Jillian – which only aired for 13 episodes. She played Ann McNeil, a widower who moved from New York to California with her teenage daughter. Throughout the ’80s Ann Jillian also took part in Bob Hope’s television specials. I got to see her in person for one of these specials. Hope famously entertained the troops overseas during Christmas week. In December of 1990, we were in the middle of Operation Desert Shield. Bob Hope and his fellow entertainers headed out there. As it turns out, the women were not allowed to perform in the Middle East. So they had to do their own portion of the tour elsewhere. One of those stops was on my ship. Ann Jillian was the MC, and she was outstanding! Along with her was Khrystyne Haje, Marie Osmond, and the headliners – The Pointer Sisters. Today Ann Jillian mostly works as a motivational speaker. Last Song: “I’d Die For You” by Bon Jovi (I thought this would be a fun one after the idiotic false rumor of Jon Bon Jovi’s death this week. Giuffria was formed as Gregg Giuffria’s side project in 1982 after his departure from the rock band, Angel. Gregg Giuffria played keyboards, and his new bandmates were David Glen Eisley (lead vocalist), Craig Goldy (guitar), Chuck Wright (bass), and Alan Krigger (drums). The band signed with MCA Records in 1984, and had a successful debut album – the self-titled Giuffria. The album spawned the hit song “Call to the Heart”, which peaked at #15 on February 2, 1985. Another single, “Lonely In Love”, had minor success, but only charted as high as #57. The band had a successful tour as the opening act on Foreigner’s Agent Provocateur Tour. Giuffria’s next album, Silk and Steel, was released in 1986, following some lineup changes. Guitarist Craig Goldy joined Dio and was replaced by guitarist Lanny Cordola. Bassist Chuck Wright, who had played on some tracks for Quiet Riot’s Metal Health album, joined Quiet Riot as an official member, and was replaced by bassist David Sikes. The album did not do very well, and the band was dropped by the record company. Giuffria disbanded soon after that. Lead singer David Glen Eisley formed the band Dirty White Boy with guitarist Earl Slick and has remained active in music, in addition to several acting roles. Gregg Giuffria has since left the music business and now owns a business in Las Vegas. What show, starring Ann Jillian, aired from 1980-1982, was cancelled, then returned with new episodes in syndication from 1985-1989? Last Question: Which of the following does Billy’s mother NOT use to kill a gremlin? Billy’s mother, Lynn Peltzer, was played by Frances Lee McCain. She was not unfamiliar to playing mothers in the ’80s. Besides playing Billy’s mother in Gremlins, she also played Ren’s mother in Footloose, and Stella Baines, Lorraine’s (Lea Thompson) mother in Back to the Future. 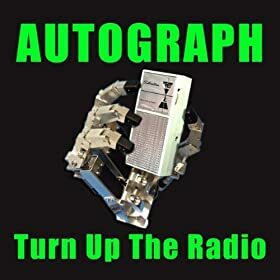 Autograph was formed in 1983. The band recorded some demos, and played them for a few close friends. One of the friends invited the band to re-record and upgrade those demos. The upgraded demos made it to David Lee Roth, who was so impressed that he invited the band to open for Van Halen during their 1984 tour. Due to their rising popularity Autograph then signed a contract with RCA Records in late 1984. Out of this came their Sign in Please album. The lead single, “Turn Up the Radio” helped the album go Platinum. The song proved to be Autograph’s only top 40 hit, peaking at #29 on March 16, 1985. Guitar Player magazine awarded Steve Lynch “Guitar Solo of the Year” for his work on this song. The band released two more albums, but nowhere as successful as their debut. They left RCA in 1988. The band would eventually be offered a new deal with Epic in 1989, but negotiations fell through at the last minute. The band then split up in December 1989. Question: Which of the following does Billy’s mother NOT use to kill a gremlin? Last Question: On Knight Rider, what was Michael Knight’s former name? Knight Rider ran from September 26, 1982, to August 8, 1986. Before his Baywatch days, and before he became a parody of himself, David Hasselhoff was Michael Long is an undercover Las Vegas police detective who, while on a case, was shot in the face and nearly killed. Self-made billionaire Wilton Knight rescued him, directed his doctors to reconstruct Long’s face, and gave him a new identity – Michael Knight. Michael was selected to be the primary field agent in the pilot program of the Knight Industries-funded public justice organization, the Foundation for Law and Government (FLAG). The other half of this pilot program – what we all know and love – was the Knight Industries Two Thousand (KITT), a heavily modified Pontiac Trans Am with numerous features including an extremely durable shell and frame, controlled by a computer with artificial intelligence. Michael and KITT were brought in during situations where “direct action might provide the only feasible solution”. Heading FLAG was Devon Miles, who provides Michael with directives and guidance. Dr. Bonnie Barstow was the chief engineer in charge of KITT’s care, as well as technical assistant to Devon.